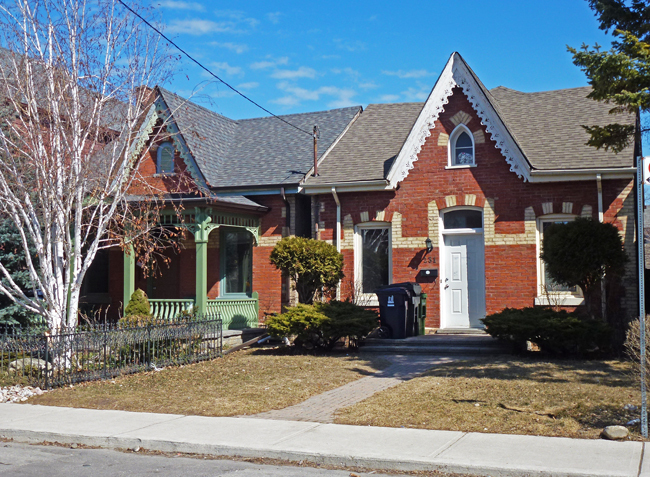 I really like Gothic Revival cottages and these ones on Clinton St are beauties that have been lovingly restored. This was a very common style in Ontario in the early 20th century. If you closely at the roofline on the right hand one it looks as f there has been an addition to the back which makes sense since they are not large houses. I like the porch on the left hand one. As I was looking at this post, I realized that I don't think I've ever seen this kind of architecture before. Very interesting and very cute. Love the brick work and that trim above the door. They may be small, but at least they're unattached. Would these places have basements? That's one thing I miss down here - we have almost no basements. What would you guess the square feet is to one of these? They are pretty! I like the patterns in the brick. I love the architecture - very pretty! The word "cottage" fits these beauties perfectly. Again I can't believe how close houses are up there. I like this architecture but the garbage cans, well they need a better spot! If these were in the UK I'd have taken them for almshouses. We have some little estates of similar small cottages, often in elaborate architectural styles, that were built by Victorian and Edwardian benefactors to house the elderly. In regards to your comment on today's post, yes, they're pics of the original artistic works, but so realistic that you need to take a closer look to verify that the beads aren't three dimensional. Hi Pat! Thanks for the explanation. They really are small, that's why I wondered if they had basements, which would give them some much needed storage. They sure are cute, though. Very different architecture style to any old building in my area. They are beauties, RedPat. There are Gothic Revival houses in central Connecticut, but almost always wooden ones, not brick. Though, we do have brick Tudors. Its a kind of architecture I see never here in Europe. Cute little places! I like the porch too.